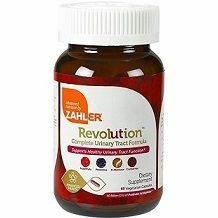 Zahler UTI Revolution claims to be as effective as antibiotics in treating urinary tract infections (UTIs) without the unwanted side effects. It claims to help fend off recurrent infections. 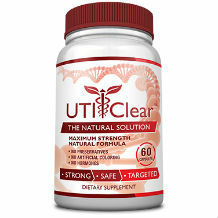 UTIs are caused by bacteria entering the urethra and bladder where they multiply and spread. Once the infection takes hold, uncomfortable symptoms follow such as a frequent urge to urinate, painful urination, and pressure in the lower abdomen. UTI Revolution contains a powerful blend of natural ingredients including D-Mannose, cranberry, probiotics and prebiotics, which provide both fast-acting relief of urinary tract infections, and a healthy, properly maintained urinary tract for long-term health and wellbeing. – Vitamin C is a powerful antioxidant. It helps prevent the common cold, may help prevent cardiovascular disease and decreases the risk of developing a urinary tract infection, (UTI). – Cranberry Fruit & Seed Powder naturally contain Vitamin C, Vitamin E (which is a fat-soluble antioxidant) as well as Vitamin K (which have anti-inflammatory) properties. – D-Mannose is a kind of sugar that is related to glucose. It is used for preventing urinary tract infections (UTIs) and treating carbohydrate-deficient glycoprotein syndrome, an inherited metabolic disorder. – Lactobacillus Acidophilus is a type of bacteria that is found in your intestines. It produces an enzyme called lactase which breaks down lactose, into lactic acid. – Pumpkin Seed Extract causes an increase in urination which helps relieve bladder discomfort. Other Ingredients: Hydroxypropyl Methylcellulose (Capsule), Microcrystalline Cellulose. Dairy free and soy free. Kosher. Pareve. The suggested use of this product is 2 capsules 2 times daily preferably with meals, with a full glass of water or as directed by a healthcare practitioner. There are 15 servings per container, 60 capsules. You need to consult with your physician first if you are either pregnant, nursing or on medication. The regular price of this product is $59.95. When purchased online the price goes for $29.98. They also have an auto-refill option which you just have to be careful of signing up for, in case you forget about it and don’t want to carry on with the product. The Professional Supplement Center, which sells this product, accepts unopened returns within 60 days of receipt for a full refund minus any shipping fees. A prepaid shipping label will be sent to you (the cost of your return is on the Professional Supplement Center). Once they receive your return, you will be refunded within 3-5 business days. We find this to be a good product with an average market price. The only concern is with the guarantee. You will not get your money back if you try this product as it only accepts unopened bottles.